When veteran cop, Jimmy Monroe (Bruce Willis, Bandits), goes to sell a rare baseball card, the store is robbed. Jimmy and his partner, Paul Hodges (Tracy Morgan, TV: 30 Rock), hunt down the thief so Jimmy can cash it in to pay for his daughter, Ava's (Michelle Trachtenberg, Eurotrip) dream wedding. The thief, Dave (Seann William Scott, Role Models), leads them to the card's new owner, which conveniently lands them in the middle of the case that got them suspended. 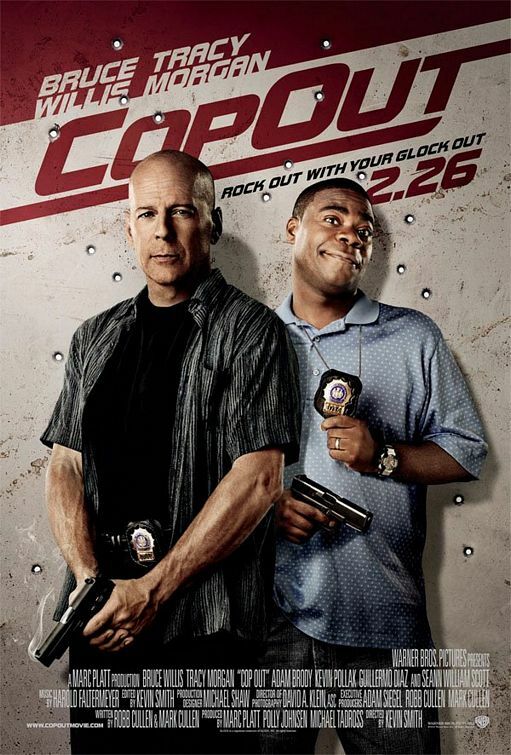 Blending action and comedy is old hat for Willis, and Cop Out proves he could do it in his sleep. Surprisingly, Tracy Morgan isn't as annoying as the trailers made him out to be. Well, he and Seann William Scott were both annoying, but in a quirky, funny kinda way. The "big bad" of the film, a thug named after a New Orleans delicacy, Poh Boy (Guillermo Diaz, The Terminal) did get on my last nerve. I assume director Kevin Smith (Mallrats) asked Diaz to give it his Ray- Liotta-in-Wild-Hogs-over-the-top all, but he could have reeled the crazy in a lil bit. It's a weak, goofy premise masked by raunchy jokes with direction that makes the story feel all over the place. More than a few funny actors, Kevin Pollack (The Whole Nine Yards), Jason Lee (Jersey Girl), and Rashida Jones (I Love You, Man) get wasted to make room for more of Morgan's shenanigans. It's not the genius of the Keystone Kops, but Cop Out can detain your attention on a lazy afternoon. It just looked like crap, Smith needs to stick with writing. this movie looks and sounds like a nightmare, and i had absolutely NO idea kevin smith directed this...wtf? i've been on a "weeds" marathon for 4 days, watching season 1-4. guillermo diaz is on the credits, but i don't know which one he is. i'm too lazy to google...i hope it's not the character named guillermo, which would just be tremendously lazy writing. @CMrok93: This definitely won't make Smith's highlights reel. I'm still waiting for his Red State project. @IW: Good thing you've got lots of Weeds to watch, since Cop Out doesn't sound like your cup o' tea. I started Weeds a while back and then got sidetracked. I really need to jump back into it. Yes, it is lazy writing b/c Guillermo Diaz plays Guillermo on Weeds.